I’ve been studying through Zephaniah recently, prompted by the recently released ESV Expository Commentary (Volume 7): Daniel–Malachi. The commentary on Zephaniah is written by Jason DeRouchie who I’ve been following since his How to Understand and Apply the Old Testament, which is fantastic. Andy Naselli’s companion volume, How to Understand and Apply the New Testament, is equally fantastic. I read it first and I’m still working through DeRouchie’s volume. Jason DeRouchie has taught though Zephaniah several times, including 15 lectures given to his adult Sunday School class at Bethlehem Baptist Church in the Fall of 2015. I’ve compiled the audio recordings from those lectures into a podcast feed for easy listening. Tim Mackie’s Bible in Five: The Minor Prophets, Part 2 which covers Zephaniah and is part of his Bible in Five series. I recently discovered an excellent narration of the Greek New Testament. It is freely available for download and streaming; the links are below. After finding these recordings on YouTube I had to dig around to find who to cite as the narrator. According to a post on Glen Scrivener’s blog, the narration is by Theo Karvounakis and the recordings are being released into the public domain by he and Matthias Müller. The readings are from Scrivener’s Textus Receptus (1894 edition) published by the Trinitarian Bible Society, the text of which is also in the public domain. I’ve listened to a bit from The Gospel of Matthew and The Gospel of John and the production quality is very good. Theo Karvounakis reads in a modern Greek pronunciation that is easy to understand and listen to. The Gospel of John: A Podcast? I’ve experimented with creating a podcast feed for these recordings so that they are easy to stream on the go. I like to listen to spoken audio in Overcast as much as possible because of the excellent Smart Speed and Voice Boost features that trim up the excess silence and enhance the audio quality so much. I started by making a feed for The Gospel of John by uploading the MP3s to the Internet Archive and hosting the podcast RSS feed on GitHub. Use the links below to subscribe. If this is useful to you then I’d love to hear your feedback. 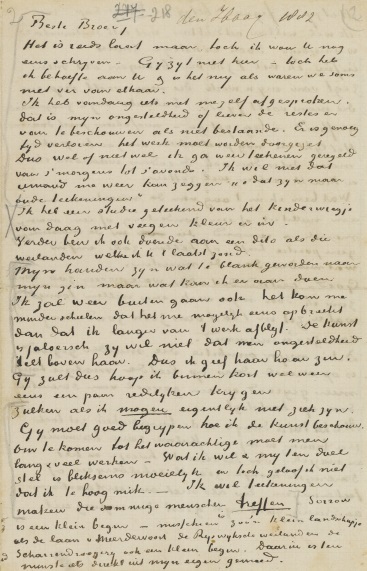 Vincent van Gogh - The Letters is an amazing archive of documents. Searchable, with facsimiles, translations, and including even the original sketches. Van Gogh seems like a fascinating person and the letters contain some gems. What am I in the eyes of most people? A nonentity or an oddity or a disagreeable person — someone who has and will have no position in society, in short a little lower than the lowest. Very well — assuming that everything is indeed like that, then through my work I’d like to show what there is in the heart of such an oddity, such a nobody. This is my ambition, which is based less on resentment than on love in spite of everything, based more on a feeling of serenity than on passion. Even though I’m often in a mess, inside me there’s still a calm, pure harmony and music. In the poorest little house, in the filthiest corner, I see paintings or drawings. And my mind turns in that direction as if with an irresistible urge. As time passes, other things are increasingly excluded, and the more they are the faster my eyes see the picturesque. Art demands persistent work, work in spite of everything, and unceasing observation. Justice has been a recurring theme that stands out to me as I read the Bible. This video from The Bible Project is really helpful to understand the biblical themes righteousness and justice. Humans are set apart from all other creatures as the image of God… This identity is the bedrock of the Bible’s view of justice. All humans are equal before God and have the right to be treated with dignity and fairness, no matter who you are. Doing righteousness… what comes to mind is, being a good person. But what does that even mean, “being good”? The biblical hebrew word for righteousness is tsĕdaqah. It’s more specific. It’s an ethical standard that refers to right relationships between people. It’s about treating others as the image of God. With the God given dignity they deserve. And this word justice, it’s the hebrew word mishpat. It can refer to retributive justice… yet most often in the Bible, mishpat refers to restorative justice. It means going a step further. Actually seeking out vulnerable people who are being taken advantage of and helping them out. …It means taking steps to advocate for the vulnerable, and changing social structures to prevent injustice. The behind-the-scenes is pretty cool as well. My desire is to think clearly about concepts and then communicate them intuitively to others. I am particularly interested in the ideas and advancements that affect our lives spiritually and emotionally. This post is as much for me as it is for you. I write a lot of PowerShell scripts and they tend to follow a certain pattern. This is my personal boilerplate for PowerShell scripts. # TODO: Insert script here. Write-Output "Done. Elapsed time: $($stopwatch.Elapsed)"
Prevents use of variables that have not been initialized. Cannot call non-existent properties on objects. Disallows calling a function like a method, e.g., Do-Something(1 2) instead of Do-Something 1 2. Prohibits creating variables without a name. Sets $ErrorActionPreference so that unhandled exceptions will halt the script execution. By default, PowerShell will roll on when an exceptions is thrown and this statement makes my scripts safe by default. Set $scriptDir to the directory path of the current script. This may be different than the working directory. Set the working directory to the $scriptDir so that relative paths in the script itself can be consistent. Most of the time I want to know how long my script takes to run so I include a $stopwatch that will output the elapsed time when the script finishes. The try...finally ensures that the elapsed time will output even if the script throws an exception. Need to wrap your PowerShells script with a batch file? Grab my PowerShell batch file wrapper. Hundreds of verses forgotten. Yep, that’s what happen to me. I joined up with our church’s Bible Quiz team as a teen and memorized hundreds of verses for competition. Looking back, it is one of my favorite things I did growing up. Unfortunately, that was many years ago and with little practice comes much forgetfulness. I kicked off 2016 by starting Fighter Verses. This is my attempt to get back into the practice of memorizing scripture. One of the ways I ingrain verses in my mind is to break them apart and mentally quiz myself. Quoting it backwards and forwards, so to speak, as I answer questions about the passage. It really works. So, dear readers, I present to you some Bible Quiz style questions I’ve been drilling for the first couple Fighter Verses. Let me know if you find these helpful! Q: What does the LORD require of Israel, according to Deuteronomy 10:12-13? To fear the LORD thy God. To serve the LORD thy God with all their heart and soul. To keep the commandments of the LORD and his statutes. Q: What reason is Israel given for keeping the LORD’s commandments and statutes, according to Deuteronomy 10:13? It is for their own good. Q: What is Israel told to do “for their own good”, according to Deuteronomy 10:13? Q: What attribute of God is mentioned in Deuteronomy 7:9? Q: What is commanded to be known in Deuteronomy 7:9? That the LORD thy God, he is God. Q: What does God promise to keep with them that love him, according to Deuteronomy 7:9? Q: Who does God promise to keep covenant and mercy with, according to Deuteronomy 7:9? Verses are quoted from the King James Version. These quotations are all from the KJV. “It is not to be expected that we should love God supremely if we have not known him to be more desirable than all other things.” So wrote the great hymn writer Isaac Watts. And of course, he was quite right, for we always love what seems most attractive to us. Just imagine for a moment a single-person god. Having been alone for eternity, would it want fellowship with us? It seems most unlikely. Would it even know what fellowship was? Almost certainly not. Such a god might allow us to live under its rule and protection, but little more. The Trinity, then, is not some awkward add-on to God, the optional extra nobody should want. No, God is beautiful, desirable, and life-giving precisely because He is the Father, the Son, and the Spirit. 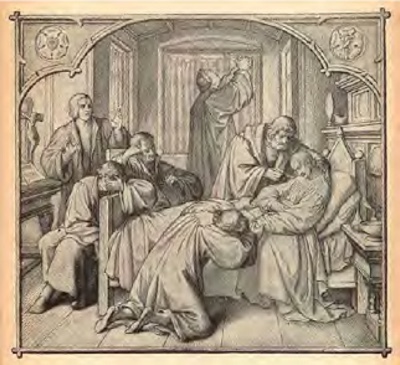 Early in the year 1535, Peter Beskendorf, a barber and an old friend of Luther’s, asked Dr. Luther for suggestions concerning prayer. Luther responded with an open letter titled, How One Should Pray, for Master Peter the Barber. This letter is as follows. Paraphrased introduction from Paster Wolfmueller of Hope Lutheran Church, Aurora, CO. 2006. First, when I feel that I have become cool and joyless in prayer because of other tasks or thoughts (for the flesh and the devil always impede and obstruct prayer), I take my little psalter, hurry to my room, or, if it be the day and hour for it, to the church where a congregation is assembled and, as time permits, I say quietly to myself and word-for-word the Ten Commandments, the Creed, and, if I have time, some words of Christ or of Paul, or some psalms, just as a child might do. It may well be that you may have some tasks which are as good or better than prayer, especially in an emergency. There is a saying ascribed to St. Jerome that everything a believer does is prayer and a proverb, “He who works faithfully prays twice.” This can be said because a believer fears and honors God in his work and remembers the commandment not to wrong anyone, or to try to steal, defraud, or cheat. Such thoughts and such faith undoubtedly transform his work into prayer and a sacrifice of praise. Yet we must be careful not to break the habit of true prayer and imagine other works to be necessary which, after all, are nothing of the kind. Thus at the end we become lax and lazy, cool and listless toward prayer. The devil who besets us is not lazy or careless, and our flesh is too ready and eager to sin and is disinclined to the spirit of prayer. Then repeat one part or as much as you wish, perhaps the first petition: “Hallowed be thy name,” and say: “Yes, Lord God, dear Father, hallowed be thy name, both in us and throughout the whole world. Destroy and root out the abominations, idolatry, and heresy of the Turk, the pope, and all false teachers and fanatics who wrongly use thy name and in scandalous ways take it in vain and horribly blaspheme it. They insistently boast that they teach thy word and the laws of the church, though they really use the devil’s deceit and trickery in thy name to wretchedly seduce many poor souls throughout the world, even killing and shedding much innocent blood, and in such persecution they believe that they render thee a divine service. You should also know that I do not want you to recite all these words in your prayer. That would make it nothing but idle chatter and prattle, read word for word out of a book as were the rosaries by the laity and the prayers of the priests and monks. Rather do I want your heart to be stirred and guided concerning the thoughts which ought to be comprehended in the Lord’s Prayer. These thoughts may be expressed, if your heart is rightly warmed and inclined toward prayer, in many different ways and with more words or fewer. I do not bind myself to such words or syllables, but say my prayers in one fashion today, in another tomorrow, depending upon my mood and feeling. I stay however, as nearly as I can, with the same general thoughts and ideas. It may happen occasionally that I may get lost among so many ideas in one petition that I forego the other six. If such an abundance of good thoughts comes to us we ought to disregard the other petitions, make room for such thoughts, listen in silence, and under no circumstances obstruct them. The Holy Spirit himself preaches here, and one word of his sermon is far better than a thousand of our prayers. Many times I have learned more from one prayer than I might have learned from much reading and speculation. It is of great importance that the heart be made ready and eager for prayer. As the Preacher says, “Prepare your heart for prayer, and do not tempt God”. What else is it but tempting God when your mouth babbles and the mind wanders to other thoughts? Like the priest who prayed, “Deus in adjutorium meum intende. Farmhand, did you unhitch the horses? Domine ad adjuvandum me festina. Maid, go out and milk the cow. Gloria patti et filio et spiritui sancto. Hurry up, boy, I wish the ague would take you!” I have heard many such prayers in my experience under the papacy; most of their prayers are of this sort. This is blasphemy and it would be better if they played at it if they cannot or do not care to do better. In my day I have prayed many such canonical hours myself, regrettably, and in such a manner that the psalm or the allotted time came to an end before I even realized whether I was at the beginning or in the middle. Though not all of them blurt out the words as did the above-mentioned cleric and mix business and prayer, they do it by the thoughts in their hearts. They jump from one thing to another in their thoughts and when it is all over they do not know what they have done or what they talked about. They start with Laudate and right away they are in a fool’s paradise. It seems to me that if someone could see what arises as prayer from a cold and unattentive heart he would conclude that he had never seen a more ridiculous kind of buffoonery. But, praise God, it is now clear to me that a person who forgets what he has said has not prayed well. In a good prayer one fully remembers every word and thought from the beginning to the end of the prayer. So, a good and attentive barber keeps his thoughts, attention, and eyes on the razor and hair and does not forget how far he has gotten with his shaving or cutting. If he wants to engage in too much conversation or let his mind wander or look somewhere else he is likely to cut his customer’s mouth, nose, or even his throat. Thus if anything is to be done well, it requires the full attention of all one’s senses and members, as the proverb says, “Pluribus intentus, minor est ad singula sensus”-“He who thinks of many things, thinks of nothing and does nothing right.” How much more does prayer call for concentration and singleness of heart if it is to be a good prayer! This in short is the way I use the Lord’s Prayer when I pray it. To this day I suckle at the Lord’s Prayer like a child, and as an old man eat and drink from it and never get my fill. It is the very best prayer, even better than the psalter, which is so very dear to me. It is surely evident that a real master composed and taught it. What a great pity that the prayer of such a master is prattled and chattered so irreverently all over the world! How many pray the Lord’s Prayer several thousand times in the course of a year, and if they were to keep on doing so for a thousand years they would not have tasted nor prayed one iota, one dot, of it! In a word, the Lord’s Prayer is the greatest martyr on earth (as are the name and word of God). Everybody tortures and abuses it; few take comfort and joy in its proper use. If I have had time and opportunity to go through the Lord’s Prayer, I do the same with the Ten Commandments. I take one part after another and free myself as much as possible from distractions in order to pray. I divide each commandment into four parts, thereby fashioning a garland of four strands. That is, I think of each commandment as, first, instruction, which is really what it is intended to be, and consider what the Lord God demands of me so earnestly. Second, I turn it into a thanksgiving; third, a confession; and fourth, a prayer. Afterward, if time and inclination permit, the Second Commandment likewise in four strands, like this: “You shall not take the name of the Lord your God in vain,” etc. First, I learn that I must keep God’s name in honor, holiness, and beauty; not to swear, curse, not to be boastful or seek honor and repute for myself, but humbly to invoke his name, to pray, praise, and extol it, and to let it be my only honor and glory that he is my God and that I am his lowly creature and unworthy servant. Second, I give thanks to him for these precious gifts, that he has revealed his name to me and bestowed it upon me, that I can glory in his name and be called God’s servant and creature, etc., that his name is my refuge like a mighty fortress to which the righteous man can flee and find protection, as Solomon says. Third, I confess and acknowledge that I have grievously and shamefully sinned against this commandment all my life. I have not only failed to invoke, extol, and honor his holy name, but have also been ungrateful for such gifts and have, by swearing, lying, and betraying, misused them in the pursuit of shame and sin. This I bitterly regret and ask grace and forgiveness, etc. Fourth, I ask for help and strength henceforth to learn this commandment and to be preserved from such evil ingratitude, abuse, and sin against his name, and that I may be found grateful in revering and honoring his name. I repeat here what I previously said in reference to the Lord’s Prayer: if in the midst of such thoughts the Holy Spirit begins to preach in your heart with rich, enlightening thoughts, honor him by letting go of this written scheme; be still and listen to him who can do better than you can. Remember what he says and note it well and you will behold wondrous things in the law of God, as David says. The Third Commandment: “Remember the sabbath day, to keep it holy.” I learn from this, first of all, that the sabbath day has not been instituted for the sake of being idle or indulging in worldly pleasures, but in order that we may keep it holy. However, it is not sanctified by our works and actions- our works are not holy-but by the word of God, which alone is wholly pure and sacred and which sanctifies everything that comes in contact with it, be it time, place, person, labor, rest, etc. According to St. Paul, who says that every creature is consecrated by word and prayer, I Timothy 4, our works are consecrated through the word. I realize therefore that on the sabbath I must, above all, hear and contemplate God’s word. Thereafter I should give thanks in my own words, praise God for all his benefits, and pray for myself and for the whole world. He who so conducts himself on the sabbath day keeps it holy. He who fails to do so is worse than the person who works on the sabbath. The Fourth Commandment: “Honor your father and your mother.” First, I learn to acknowledge God, my Greater; how wondrously he has created me, body and soul; and how he has given me life through my parents and has ins ed in them the desire to care for me, the fruit of their bodies, with all their power. He has brought me into this world, has sustained and cared for me, nurtured and educated me with great diligence, carefulness, and concern, through danger, trouble, and hard work. To this moment he protects me, his creature, and helps me in countless dangers and troubles. It is as though he were creating me anew every moment. But the devil does not willingly concede us one single moment of life. Second, I thank the rich and gracious Greater on behalf of myself and all the world that he has established and assured in the commandment the increase and preservation of the human race, that is, of households and of states. Without these two institutions or governments the world could not exist a single year, because without government there can be no peace, and where there is no peace there can be no family; without family, children cannot be begotten or raised, and fatherhood and motherhood would cease to be. It is the purpose of this commandment to guard and preserve both family and state, to admonish children and subjects to be obedient, and to enforce it, too, and to let no violation go unpunished-otherwise children would have disrupted the family long ago by their disobedience, and subjects would have disorganized the state and laid it to waste for they outnumber parents and rulers. There are no words to fully describe the benefit of this commandment. Third, I confess and lament my wicked disobedience and sin; in defiance of God’s commandment I have not honored or obeyed my parents; I have often provoked and offended them, have been impatient with their parental discipline, have been resentful and scornful of their loving admonition and have rather gone along with loose company and evil companions. God himself condemns such disobedient children and withholds from them a long life; many of them succumb and perish in disgrace before they reach adulthood. Whoever does not obey father and mother must obey the executioner or otherwise come, through God’s wrath, to an evil end, etc. Of all this I repent and ask for grace and forgiveness. Fourth, I pray for myself and for all the world that God would bestow his grace and pour his blessing richly upon the family and the state. Grant that from this time on we may be devout, honor our parents, obey our superiors, and resist the devil when he entices us to be disobedient and rebellious, and so may we help improve home and nation by our actions and thus preserve the peace, all to the praise and glory of God for our own benefit and for the prosperity of all. Grant that we may acknowledge these his gifts and be thankful for them. At this point we should add a prayer for our parents and superiors, that God may grant them understanding and wisdom to govern and rule us in peace and happiness. May he preserve them from tyranny, from riot and fury, and turn them to honor God’s word and not oppress it, nor persecute anyone or do injustice. Such excellent gifts must be sought by prayer, as St. Paul teaches; otherwise the devil will reign in the palace and everything fall into chaos and confusion. If you are a father or mother, you should at this point remember your children and the workers in your household. Pray earnestly to the dear Father, who has set you in an office of honor in his name and intends that you be honored by the name “father.” Ask that he grant you grace and blessing to look after and support your wife, children, and servants in a godly and Christian manner. May he give you wisdom and strength to train them well in heart and will to follow your instruction with obedience. Both are God’s gifts, your children and the way they flourish, that they turn out well and that they remain so. Otherwise the home is nothing but a pigsty and school for rascals, as one can see among the uncouth and godless. The Fifth Commandment: “You shall not kill.” Here I learn, first of all, that God desires me to love my neighbor, so that I do him no bodily harm, either by word or action, neither injure nor take revenge upon him in anger, vexation, envy, hatred, or for any evil reason, but realize that I am obliged to assist and counsel him in every bodily need. In this commandment God commands me to protect my neighbor’s body and in turn commands my neighbor to protect my own. As Sirach says, “He has committed to each of us his neighbor”. Second, I give thanks for such ineffable love, providence, and faithfulness toward me by which he has placed this mighty shield and wall to protect my physical safety. All are obliged to care for me and protect me, and I, in turn, must behave likewise toward others. He upholds this command and, where it is not observed, he has established the sword as punishment for those who do not live up to it. Were it not for this excellent commandment and ordinance, the devil would instigate such a massacre among men that no one could live in safety for a single hour-as happens when God becomes angry and inflicts punishment upon a disobedient and ungrateful world. Third, I confess and lament my own wickedness and that of the world, not only that we are so terribly ungrateful for such fatherly love and solicitude toward us-but what is especially scandalous, that we do not acknowledge this commandment and teaching, are unwilling to learn it, and neglect it as though it did not concern us or we had no part in it. We amble along complacently, feel no remorse that in defiance of this commandment we neglect our neighbor, and, yes, we desert him, persecute, injure, or even kill him in our thoughts. We indulge in anger, rage, and villainy as though we were doing a fine and noble thing. Really, it is high time that we started to deplore and bewail how much we have acted like rogues and like unseeing, unruly, and unfeeling persons who kick, scratch, tear, and devour one another like furious beasts and pay no heed to this serious and divine command, etc. Fourth, I pray the dear Father to lead us to an understanding of this his sacred commandment and to help us keep it and live in accordance with it. May he preserve us from the murderer who is the master of every form of murder and violence. May he grant us his grace that we and all others may treat each other in kindly, gentle, charitable ways, forgiving one another from the heart, bearing each other’s faults and shortcomings in a Christian and brotherly manner, and thus living together in true peace and concord, as the commandment teaches and requires us to do. The Sixth Commandment: “You shall not commit adultery.” Here I learn once more what God intends and expects me to do, namely, to live chastely, decently, and temperately, both in thoughts and in words and actions, and not to disgrace any man’s wife, daughter, or maidservant. More than this, I ought to assist, save, protect, and guard marriage and decency to the best of my ability; I should silence the idle thoughts of those who want to destroy and slander their reputation. All this I am obliged to do, and God expects me not only to leave my neighbor’s wife and family unmolested, but I owe it to my neighbor to preserve and protect his good character and honor, just as I would want my neighbor to do for me and mine in keeping with this commandment. Second, I thank my faithful and dear Father for his grace and benevolence by which he accepts my husband, son, servant, wife, daughter, maidservant into his care and protection and forbids so sternly and firmly anything that would bring them into disrepute. He protects and upholds this commandment and does not leave violations unpunished, even though he himself has to act if someone disregards and violates the commandment and precept. No one escapes him; he must either pay the penalty or eventually atone for such lust in the fires of hell. God desires chastity and will not tolerate adultery. That can be seen every day when the impenitent and profligate are overtaken by the wrath of God and perish miserably. Otherwise it would be impossible to guard one’s wife, child, and servants against the devil’s filthiness for a single hour or preserve them in honor and decency. What would happen would be unbridled immorality and beastliness, as happens when God in his wrath withdraws his hand and permits everything to go to wrack and ruin. Third, I confess and acknowledge my sin, my own and that of all the world, how I have sinned against this commandment my whole life in thought, word, and action. Not only have I been ungrateful for these excellent teachings and gifts, but I have complained and rebelled against the divine requirement of such decency and chastity, that God has not permitted all sorts of fornication and rascality to go unchecked and unpunished. He will not allow marriage to be despised, ridiculed, or condemned, etc. Sins against this commandment are, above all others, the grossest and most conspicuous and cannot be covered up or whitewashed. For this I am sorry, etc. Fourth, I pray for myself and all the world that God may grant us grace to keep this commandment gladly and cheerfully in order that we might ourselves live in chastity and also help and support others to do likewise. Then I continue with the other commandments as I have time or opportunity or am in the mood for it. As I have said before, I do not want anyone to feel bound by my words or thoughts. I only want to offer an example for those who may wish to follow it; let anyone improve it who is able to do so and let him meditate either upon all commandments at one time or on as many as he may desire. For the mind, once it is seriously occupied with a matter, be it good or evil, can ponder more in one moment than the tongue can recite in ten hours or the pen write in ten days. There is something quick, subtle, and mighty about the mind and soul. It is able to review the Ten Commandments in their fourfold aspect very rapidly if it wants to do so and is in earnest. In addition I give thanks for his steadfast goodness in that he has given such excellent teachings, assurance, and protection to me and to all the world. If it were not for his protection, not a penny or a crumb of bread would be left in the house. Third, I confess my sins and ingratitude in such instances where I have wronged, deprived, or cheated anyone in my life. The Eighth Commandment: “You shall not bear false witness.” This teaches us, first of all, to be truthful to each other, to shun lies and calumnies, to be glad to speak well of each other, and to delight in hearing what is good about others. Thus a wall has been built around our good reputation and integrity to protect it against malicious gossip and deceitful tongues; God will not let that go unpunished, as he has said in the other commandments. We owe him thanks both for the teachings and the protection which he has graciously provided for us. Third, we confess and ask forgiveness that we have spent our lives in ingratitude and sin and have maligned our neighbor with false and wicked talk, though we owe him the same preservation of honor and integrity which we desire for ourselves. Fourth, we ask for help from now on to keep the commandment and for a healing tongue, etc. The Ninth and Tenth Commandments: “You shall not covet your neighbor’s house.” Similarly, “his wife,” etc. This teaches us first that we shall not dispossess our neighbor of his goods under pretense of legal claims, or lure away, alienate, or extort what is his, but help him to keep what is his, just as we wish to be done for ourselves. It is also a protection against the subtleties and chicaneries of shrewd manipulators who will receive their punishment in the end. Second, we should render thanks to him. Third, we should repentantly and sorrowfully confess our sins. These are the Ten Commandments in their fourfold aspect, namely, as a school text, song book, penitential book, and prayer book. They are intended to help the heart come to itself and grow zealous in prayer. Take care, however, not to undertake all of this or so much that one becomes weary in spirit. Likewise, a good prayer should not be lengthy or drawn out, but frequent and ardent. It is enough to consider one section or half a section which kindles a fire in the heart. This the Spirit will grant us and continually instruct us in when, by God’s word, our hearts have been cleared and freed of outside thoughts and concerns. Nothing can be said here about the part of faith and Holy Scriptures because there would be no end to what could be said. With practice one can take the Ten Commandments on one day, a psalm or chapter of Holy Scripture the next day, and use them as flint and steel to kindle a flame in the heart. If you have more time, or the inclination, you may treat the Creed in the same manner and make it into a garland of four strands. The Creed, however, consists of three main parts or articles, corresponding to the three Persons of the Divine Majesty, as it has been so divided in the Catechism and elsewhere. Here, first of all, a great light shines into your heart if you permit it to and teaches you in a few words what all the languages of the world and a multitude of books cannot describe or fathom in words, namely, who you are, whence you came, whence came heaven and earth. You are God’s creation, his handiwork, his workmanship. That is, of yourself and in yourself you are nothing, can do nothing, know nothing, are capable of nothing. What were you a thousand years ago? What were heaven and earth six thousand years ago? Nothing, just as that which will never be created is nothing. But what you are, know, can do, and can achieve is God’s creation, as you confess by word of mouth. Therefore you have nothing to boast of before God except that you are nothing and he is your Creator who can annihilate you at any moment. Reason knows nothing of such a light. Many great people have sought to know what heaven and earth, man and creatures are and have found no answer. But here it is declared and faith affirms that God has created everything out of nothing. Here is the soul’s garden of pleasure, along whose paths we enjoy the works of God-but it would take too long to describe all that. Furthermore, we should give thanks to God that in his kindness he has created us out of nothing and provides for our daily needs out of nothing-has made us to be such excellent beings with body and soul, intelligence, five senses, and has ordained us to be masters of earth, of fish, bird, and beast, etc. Here consider Genesis, chapters one to three. Third, we should confess and lament our lack of faith and gratitude in failing to take this to heart, or to believe, ponder, and acknowledge it, and having been more stupid than unthinking beasts. Fourth, we pray for a true and confident faith that sincerely esteems and trusts God to be our Creator, as this article declares. The Second Article of Redemption: “And in Jesus Christ, his only Son, our Lord,” etc. Again a great light shines forth and teaches us how Christ, God’s Son, has redeemed us from death which, after the creation, had become our lot through Adam’s fall and in which we would have perished eternally. Now think: just as in the first article you were to consider yourself one of God’s creatures and not doubt it, now you must think of yourself as one of the redeemed and never doubt that. Emphasize one word above all others, for instance, Jesus Christ, our Lord. Likewise, suffered for us, died for us, arose for us. All this is ours and pertains to us; that us includes yourself, as the word of God declares. Second, you must be sincerely grateful for such grace and rejoice in your salvation. Third, you must sorrowfully lament and confess your wicked unbelief and mistrust of such a gift. Oh, what thoughts will come to mind-the idolatry you have practiced repeatedly, how much you have made of praying to the saints and of innumerable good works of yours which have opposed such salvation. Fourth, pray now that God will preserve you from this time forward to the end in true and pure faith in Christ our Lord. The Third Article of Sanctification: “I believe in the Holy Spirit,” etc. This is the third great light which teaches us where such a Creator and Redeemer may be found and plainly encountered in this world, and what this will all come to in the end. Much could be said about this, but here is a summary: Where the holy Christian church exists, there we can find God the Creator, God the Redeemer, God the Holy Spirit, that is, him who daily sanctifies us through the forgiveness of sins, etc. The church exists where the word of God concerning such faith is rightly preached and confessed. Again you have occasion here to ponder long about everything that the Holy Spirit accomplishes in the church every day, etc. Therefore be thankful that you have been called and have come into such a church. Confess and lament your lack of faith and gratitude, that you have neglected all this, and pray for a true and steadfast faith that will remain and endure until you come to that place where all endures forever, that is, beyond the resurrection from the dead, in life eternal. Amen. This letter is widely reproduced, including J. J. Pelikan, H. C. Oswald & H. T. Lehmann, Eds., Luther’s Works, American Edition, Vol. 43. “Devotional Writings II” (Philadelphia: Fortress Press, and St. Louis: Concordia Publishing House, 1968).